TVXQ! 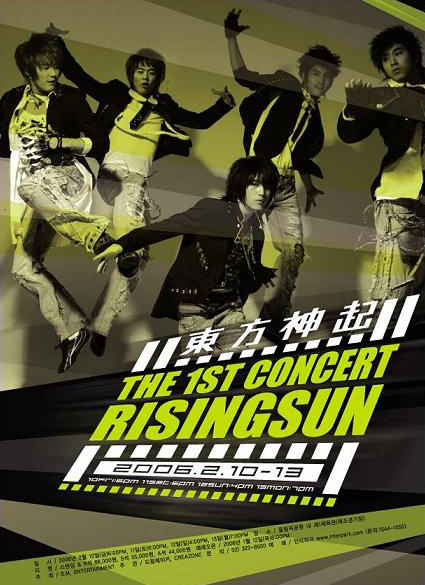 The 1st Asia Tour Concert “Rising Sun”, also known as TVXQ! 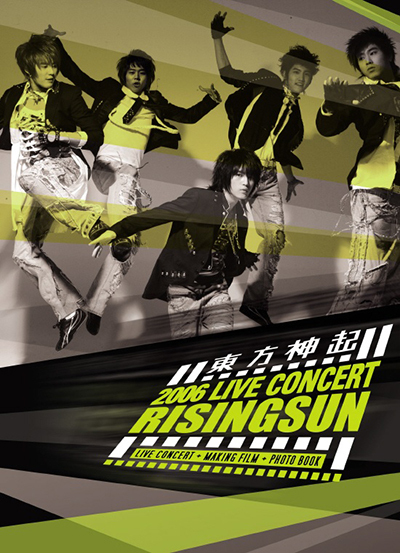 1st CONCERT “Rising Sun”, was the first international and debut concert tour of TVXQ!, organized in support of their second Korean studio album, Rising Sun. TVXQ! performed a total of six shows in three Asian cities in 2006. TVXQ! performing “The Way U Are” in Seoul. Photo: S.M. Entertainment. S.M. 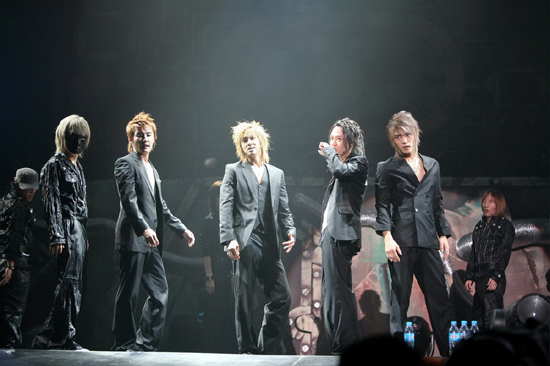 Entertainment first announced the start of the Asia tour with the show in Seoul on January 3, 2006. TVXQ! performed songs from their Tri-Angle and Rising Sun albums. The show lasted for about two hours and fifteen minutes. 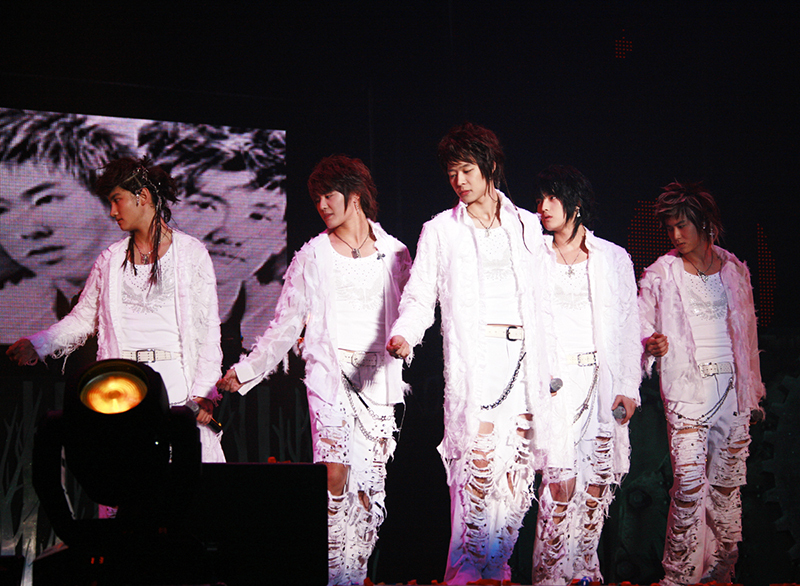 Rehearsals took place ‘til February 9, 2006 in Seoul Olympic Park Gymnasium. About 25 songs were performed in each show. All songs were performed live except “TRI-ANGLE”, “Free Your Mind”, “Dangerous Mind”, “The Way U Are” and “Rising Sun(순수)” that were lip-synced to showcase better dance performances. During “너희들 것이니까(I Wish…)”, Jaejoong rode a bicycle in mid-air across the stage as a nod to the film E.T..
For the solo performances, Yunho did a mix dance performance of Terror Squad’s “Lean Back”, Fatman Scoop’s “Be Faithful” and Ying Yang Twins (feat. Nick Cannon)’s “Get Crunk Shorty”. Yoochun sang “여우비(Like Weather…)”, a self-composed song specifically for his solo performance in this tour. Changmin performed a dance stage with Michael Jackson’s “The Way You Make Me Feel” and Usher’s “Caught Up” as the background musics. Junsu performed his own rendition of Blue’s 2001 debut single “All Rise” with Super Junior’s Eunhyuk as the special guest to perform the rap for the shows in Seoul. Jaejoong covered Emerald Castle’s “발걸음(Footsteps)”, a song from 1997. The solo performances were excluded in both Kuala Lumpur and Bangkok shows. TVXQ! performing “믿어요” in Seoul. Photo: S.M. Entertainment. In September 2005, Jaejoong ruptured his cartilage in his knee while rehearsing for the music video of “Rising Sun”. A stand-in dancer had to replace Jaejoong’s post for performances with intense choreography by wearing a silver mask during the shows in Seoul. Jaejoong fully recovered and got back on stage in time for their remaining shows in the tour. 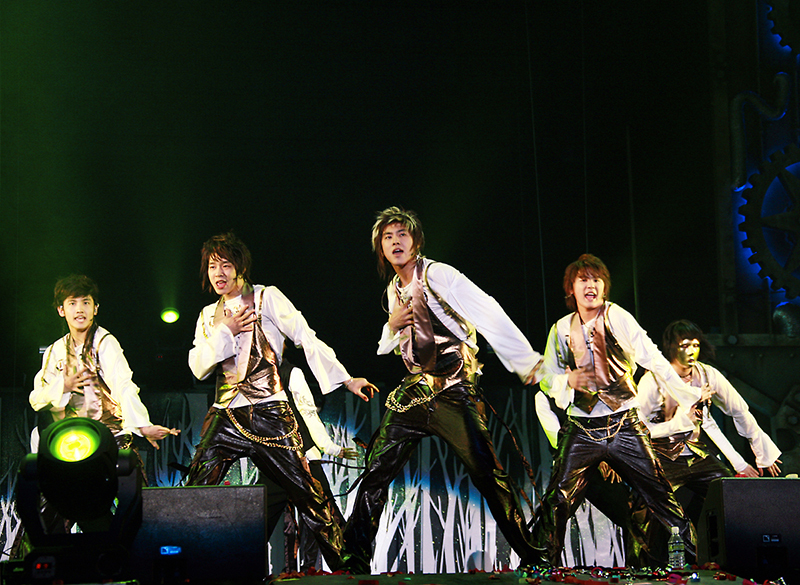 On September 12, 2006, Changmin twisted his right ankle during the final rehearsal for their Bangkok concert. A stand-in dancer was called in to perform on behalf of Changmin. S.M. Entertainment insured a total of KRW 4 billion (approximate USD 3.4 million) to prepare for unpredictable incidents among the 40,000 fans and staffs in South Korea. 150 security personnel were assigned throughout the four-night concert. S.M. Entertainment provided photo updates from the February 10th and 11th shows an hour after they kicked off through SK Telecom (SKT) and Korea Telecom Freetel (KTF). S.M. Entertainment, in cooperation with Avex, set up a tour package event for a total of 120 Japanese fans. TVXQ! 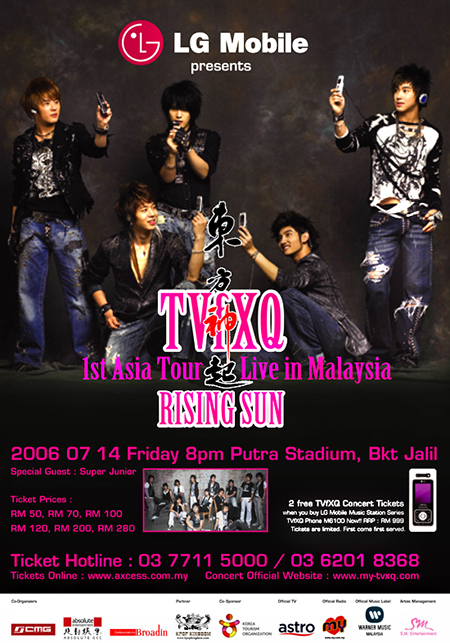 was the first Korean performers to stage a concert in Malaysia. Labelmate Super Junior attended the concert as a 13-member band to perform “Twins (Knock Out)”, “차근차근(Way For Love)”, “Miracle”, “So I” and “U” for a special stage in the later half of the show. 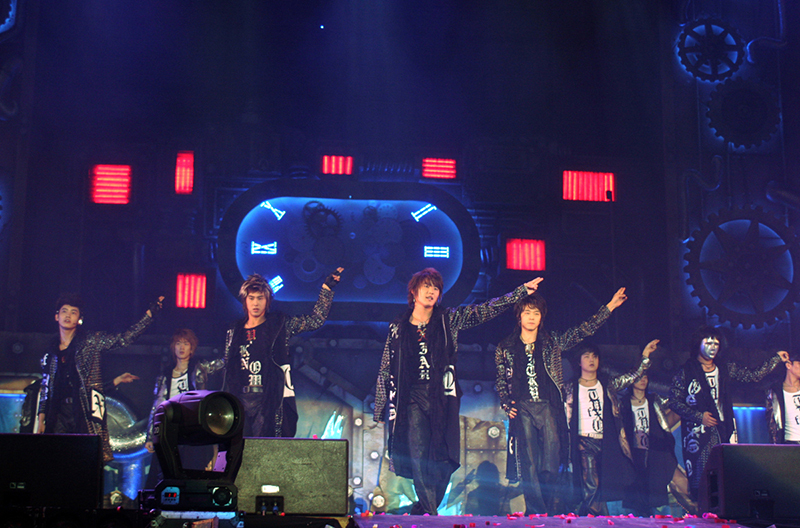 Super Junior was the regular guest star for the same concert in Bangkok. S.M. Entertainment also released a tour package course of four days and three nights for the Korean fans to experience the concert in Kuala Lumpur. 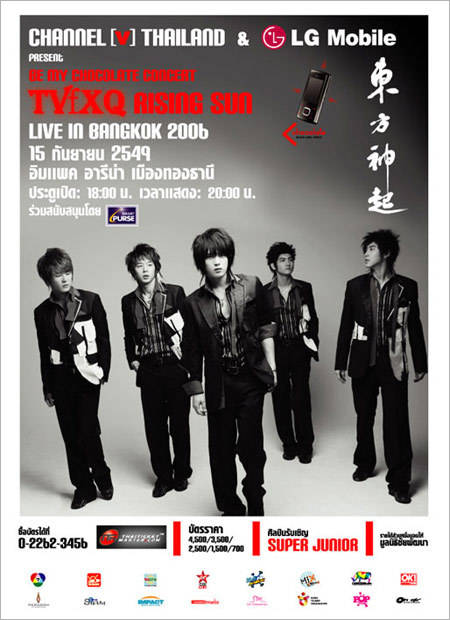 In Bangkok, their concert was titled as Be My Chocolate Concert TVfXQ Rising Sun Live in Bangkok 2006. Super Junior did not perform “차근차근(Way For Love)” and “So I” in this concert. Super Junior’s Heechul did not attend the show following a car accident. TVXQ! in glass capsules during the opening sequence in Kuala Lumpur. Photo: S.M. Entertainment. In the opening sequence of the concert, the creation of TVXQ! through large glass capsules on stage was designed to create a feeling of an outer space and appear in a whole new world. Illusions on stage were designed by Malaysia-born magician Anslem Roy for the opening show, and the stage performances during “I Wanna Hold You” and “The Way U Are”. 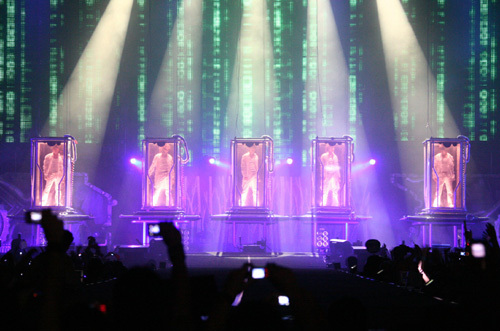 TVXQ!’s three-dimensional stage, which was decorated with images crossing over the past and future and transcending time and space, rotated dynamically for each songs and large screens. These screens, directed by Cheon Hyeok Jin, would split into five different directions. Geometrical sculptures were placed accordingly on the stage to provide a science fiction atmosphere. About KRW 300 million (approximate USD 260,000) was spent only on the stage illusions while KRW 1 billion (approximate USD 860,000) was invested on the stage, video and screens for the four-night show in Seoul. The stage development for the show in Kuala Lumpur cost more than MYR 500,000 (approximate USD 131,000). Four 40-feet container boxes carrying stage sets that weighed 15 tons, including the 30m x 80m stage and five screens, were brought directly from South Korea to Bangkok. The sets were the same exact ones that were used in the solo concert in South Korea back in February. The total cost for the stage transportation, development, setting, and manufacture, and 100 staff members for the concert in Bangkok reached KRW 1 billion (approximate USD 860,000). The organizer had to reduce the size of the stage by 1m to incorporate an additional 2,000 audience from the originally 12,000 sold-out seats in the concert hall. TVXQ! performing “TRI-ANGLE” in Seoul. Photo: S.M. Entertainment. 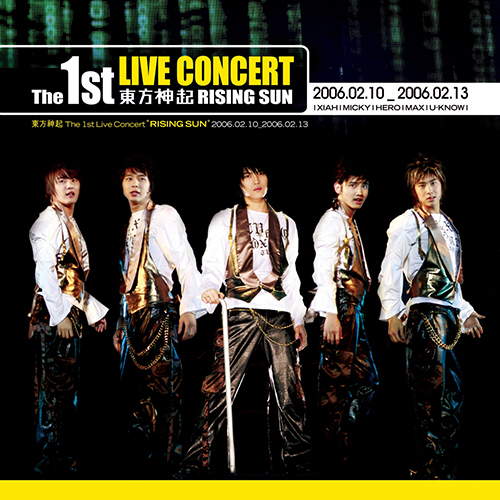 Highlights from the Seoul concert were aired as a 6-minute broadcast on the Japanese TV program, Onryu on March 7, 2006. In South Korea, Mnet aired behind the scenes for its Wide Entertainment News segment that showed TVXQ! filming for the “Rising Sun(순수)” concert interlude while riding motorcycles. On September 16, 2006, KBS aired a 4-minute clip showing scenes of the Bangkok concert and interview sessions with members. On August 26, 2009, the Japanese broadcasting channel, TBSch., aired several performances that were recorded professionally by the production crew of S.M. Entertainment from the concert in Seoul. The February 13, 2006 show was recorded into a live CD and a DVD, which were sold separately. On July 12, 2006, the live CD was first released. It is accompanied by a 20-page color booklet consisting of concert photos and lyrics of the songs that were performed. Avex Taiwan released a Taiwanese edition for this 34-track album six days later, which came with a folded leaflet of Chinese lyrics. The DVD was sold on January 18, 2007. It was released as a 2-disc DVD including a 50-page color photo book. The release comes with concert rehearsals, highlights, backstage and interviews with the members before the show, and a still gallery featurette in the second disc. The Taiwanese version was released as deluxe edition by Avex Taiwan on April 20, 2007. Changmin’s solo performances “The Way You Make Me Feel” and “Caught Up” were not included in any of the releases due to copyright issues. An official music video for the remixed “Free Your Mind” containing montages and various captures from the shows in Seoul was released in the first disc of the 5-DVD ‘All About 東方神起 :: Season 2′ documentary on November 21, 2007. In 2009, S.M. Entertainment re-released the same music video on its YouTube channel. The concert in Seoul was filmed as part of the plot for the band’s theatrical TV drama, Vacation. The TV drama was first aired in July 2006 and was released in the Version C of their third Korean studio repackage album “O”-Jung.Ban.Hap. in November 2006. TVXQ! on stage in Bangkok. Photo: S.M. Entertainment. The ticketing site for the Seoul concert crashed during the ticket launch as 250,000 fans rushed to book their tickets. The concert was originally to be held for three days on the 10th, 11th and 13th of February but due to requests for an additional show, the concert on the 12th was organized at the last minute. All 40,000 tickets were sold out. On February 10, 2006, 20 fans, among whom were three Chinese fans, passed out from the heat after the concert had just started. The fans were escorted out from the hall and were treated by standby paramedics. The next day, it was reported that 24 fans had fainted during the show. S.M. Entertainment had predicted these such situations and had earlier prepared an ambulance, two firetrucks and nine paramedics. The incident was said to be unusual for people to have collapsed during a winter concert. 250 buses were chartered by local fans from other districts to watch the shows in Seoul. Over 200 press and medias filled both inside and outside the concert venue on these days. Many fans gathered outside the venue in early morning to attend the shows in Seoul. The concert attracted 1,000 fans from Japan, China, Taiwan, Hong Kong, Thailand, Singapore, Malaysia, and Indonesia. Families of each member, vocal trainers and actor Hyun Bin were invited to the same concert. Press from seven different countries including China, Taiwan, Hong Kong, Thailand and the United States flew to Seoul to see the first Seoul concert. Mark Russell of Billboard U.S. attended the same concert as well. Six famous Japanese sports press including Nikkan Sports and Sankei Sports came to the February 12th and 13th shows. In Kuala Lumpur, fans, press and medias filled the arrival hall at the airport on July 13, 2006. The fans hung various placards around the airport and sang “One”, “Hug(포옹)” and other hit songs in unison. Barricades that were set up earlier to guard the arrival gates collapsed and the airport went chaos. About 35 press including local newspapers News Straits Times, Utusan Malaysia, Harian Metro, The China Press, Oriental Daily News, and reporters from 20 media companies from Singapore and Thailand attended the Malaysian press conference on July 13, 2006. TV station NTD TV from China and Japanese news station The Nikkei (formerly known as Nihon Keizai) participated as well. The concert on the following day attracted fans from Indonesia, Singapore, Thailand, Brunei and other neighboring countries. 2,000 tickets for the finale show in Bangkok were sold out in two days after its launch. About 200 reporters came to concert’s press conference. The show on September 15, 2006 gathered audience from South Korea, Thailand, China, Japan, Hong Kong, Taiwan, Singapore, Malaysia and Vietnam. Local organizer, Channel V, revealed that 10 people from the audience had fainted during the show. This set list is representative of the performance in Seoul. ● The Way U Are_Extended Ver. List of concerts, showing date, country, city, venue, showtime and attendance. This page was last modified on August 20, 2015.